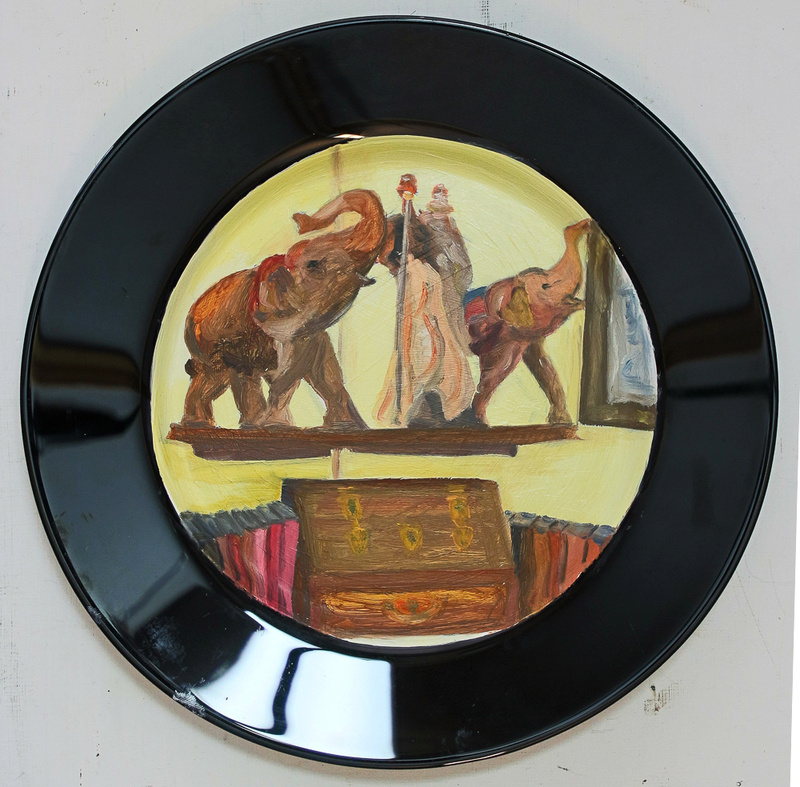 Following some initial feedback from my tutor I prepared another five circular tondos. These were all based on segments of the work I had already produced – but this time applying thinned oil paint more broadly and gesturally. 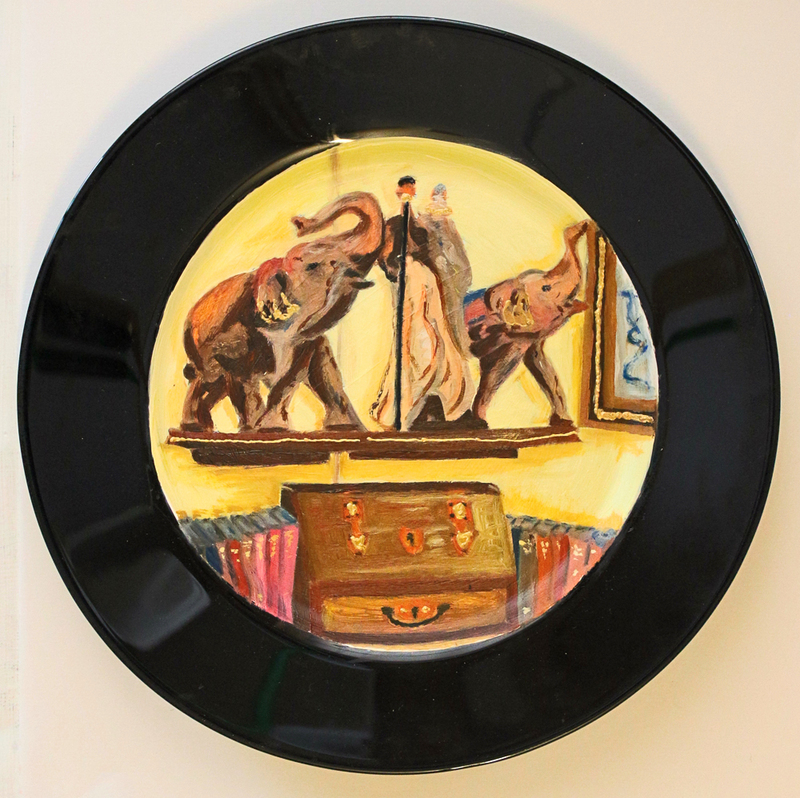 Different colour scheme from my original tondo painted on a ceramic dinner plate – mainly browns, yellows and blues with a touch of orange – painted using a size 8 short flat and a size 10 filbert brushes. 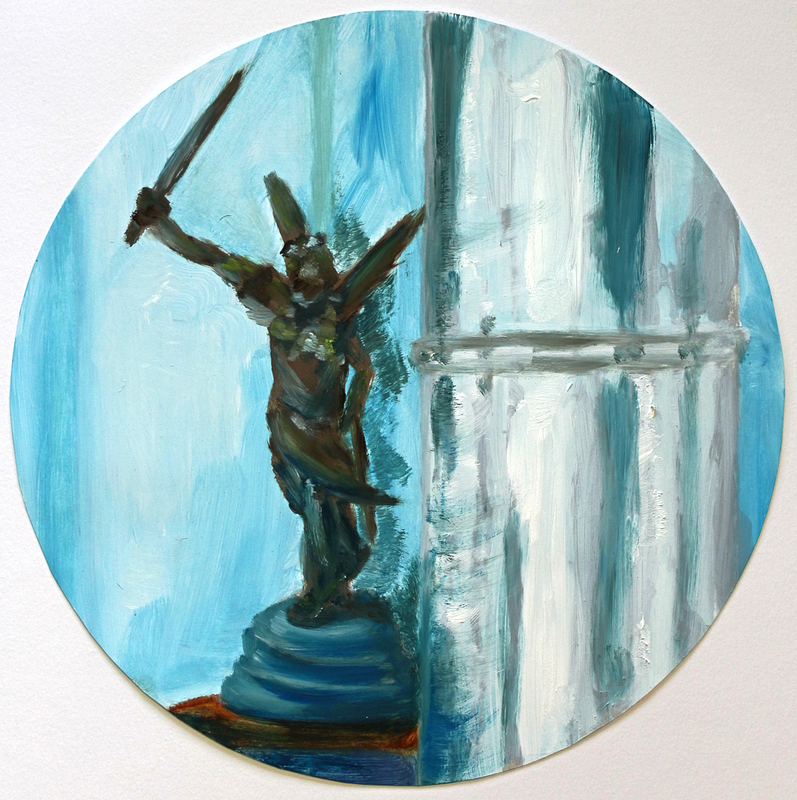 Different colour scheme from my original tondo of this subject painted on a small oval card practice piece – this time painted much larger and mainly using blues and browns with white – again painted with size 8 short flat and size 10 filbert brushes. 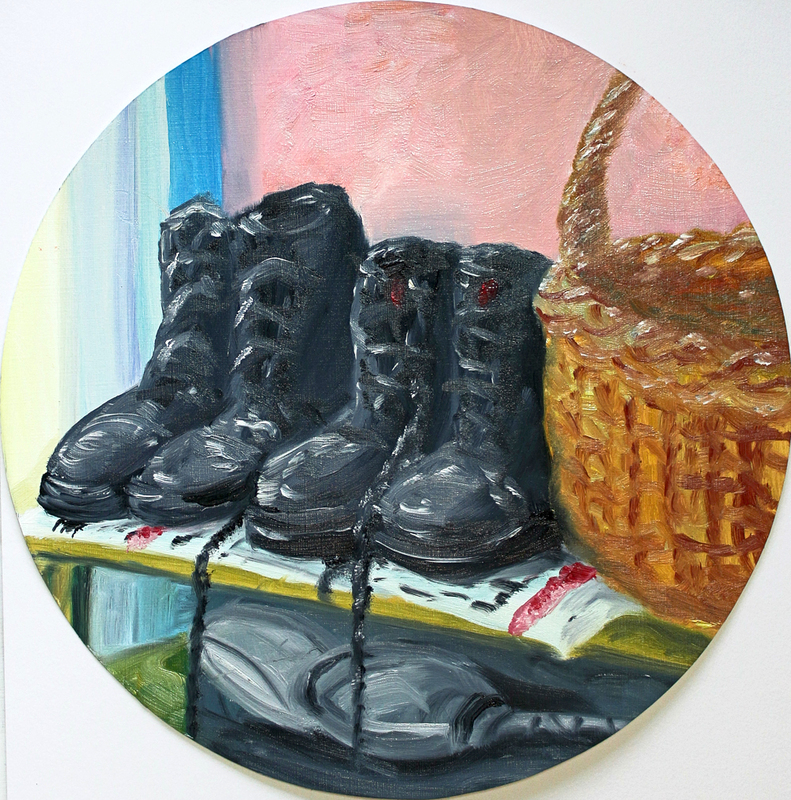 Focused in on my original ‘boots & basket’ scene and changed the colour scheme slightly – mainly blues, reds, yellow ochre, browns, pain’s grey, ivory black and white – this time painted with a size 10 filbert brush. Almost like a spy-glass look into a part of the porch barometer in the background of my Assignment piece – this time using thinned red/white mix, pain’s grey and gold and blue relief paste. 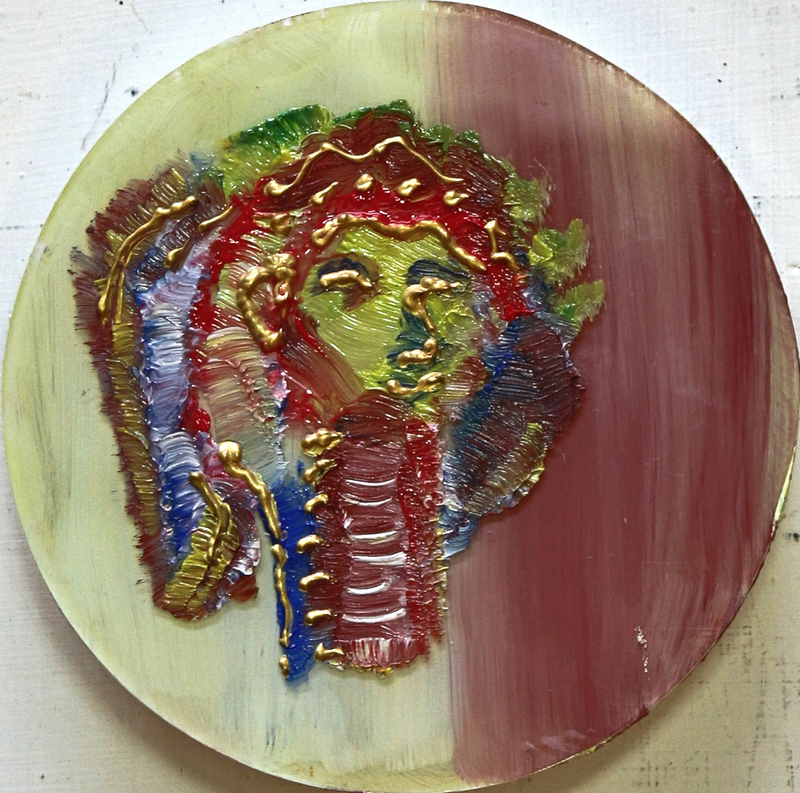 The Egyptian head from my cut off piece of football tondo – painted on both sides using thinned yellow, red and blue oils, with touches of white and gold relief paste. I am relatively pleased with how these extra pieces turned out and have learnt a good lesson in the process – don’t necessarily follow the course notes too literally! Better to use your own judgement, experiment and paint what and how it feels right for you. These five pieces are painted in a much broader and more gestural style – less fussy – and I would say, more like how I do like to paint. Maybe I’m beginning to ‘hear my voice’? For a bit of fun, here is an image of my palette for this revisiting – messy, and probably says a fair bit about the way I work! I have reviewed my work for Part 4 prior to completing the Assignment. In Part Four you’ve chosen a medium to work with in greater depth. In your learning log reflect on the frustrations, successes and failures you’ve encountered. Keep and document your ‘failures’ – they may have qualities you don’t yet see. Whilst reflecting on the work you’ve made for Part Four, consider how you’d like to develop this in Part Five. 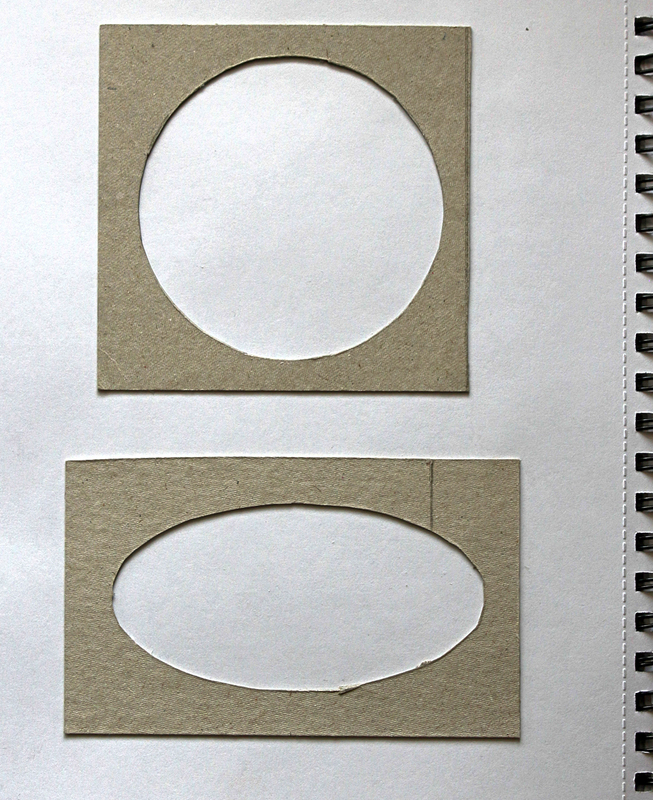 You can continue with your chosen medium in Part Five, start again with a new one, or combine it with another medium. Note down in your learning log what you feel are the qualities of the medium/media you’ve chosen and how you hope to exploit these qualities. Turn back to the end of Part One and use the ideas there to help you think about how you can link your work on Part Four to the assessment criteria. Thinned oil paint was my medium of choice for the Part 4 exercises. I mostly used Liquin for this, although also tried Reeves Painting Medium, which took longer to dry. However, both did achieve a mix of thinned oil paint that I found worked well. I had painted with thin oil paint in Part 3, but usually in my own practice I favour thicker, impasto like oil and acrylic applications of paint. I then set about seeking out suitable domestic interior areas around the house. 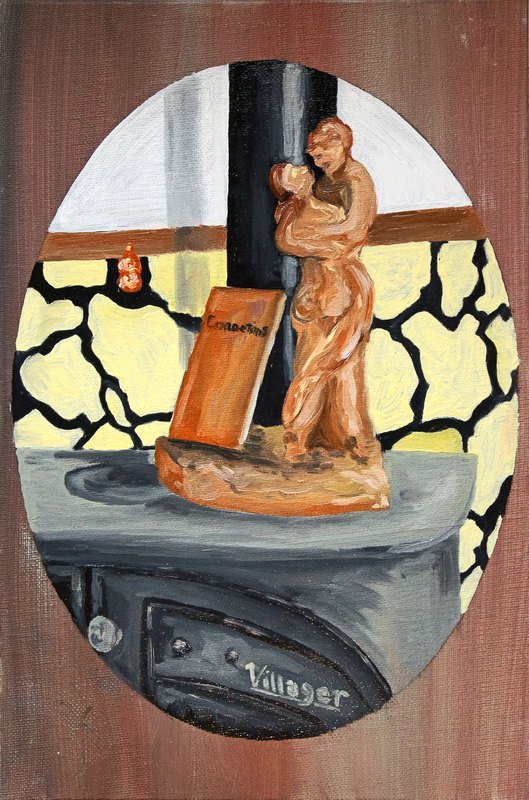 Before starting on the exercises, I made five sketches of subjects that interested me and experimented with applying thinned oil paint – https://stuartbrownleeocaupm.wordpress.com/category/sketchbook/ – these included kitchen dresser shelf with china (on oval white gessoed thick card), guitars and bookshelf (on oval black gessoed thick card), stern and cabin of model boat (on clear circle of PVC), kitchen statue (on small oval white gessoed thick card), and porch shelf with boots and basket (on oval black gessoed card). 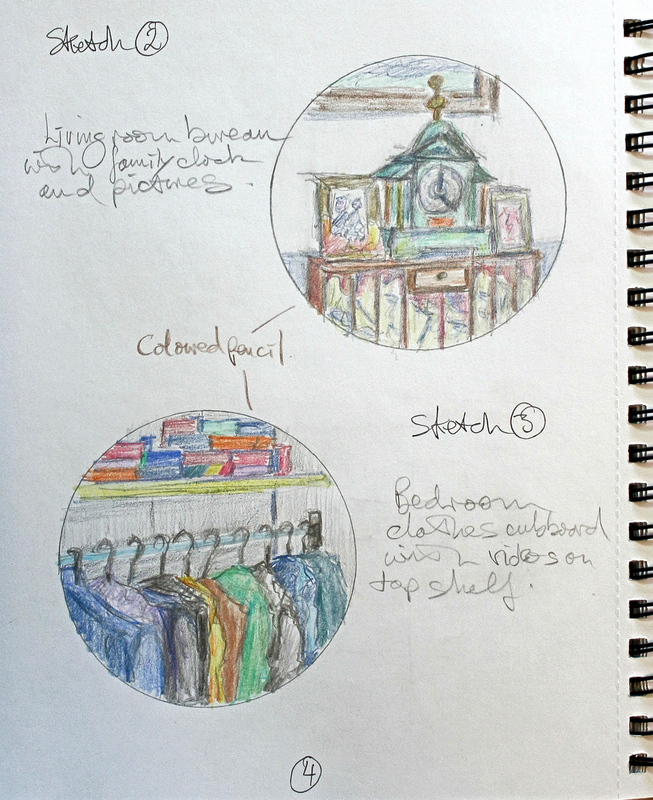 For the series of exercises, I made a total of nine sketches of different small, focused areas of interest around the house, including bedroom shoe rack, corner wall ornaments (2), model boat, music recording equipment, bedroom wardrobe, tool cupboard, clock and bureau, statue and stove. 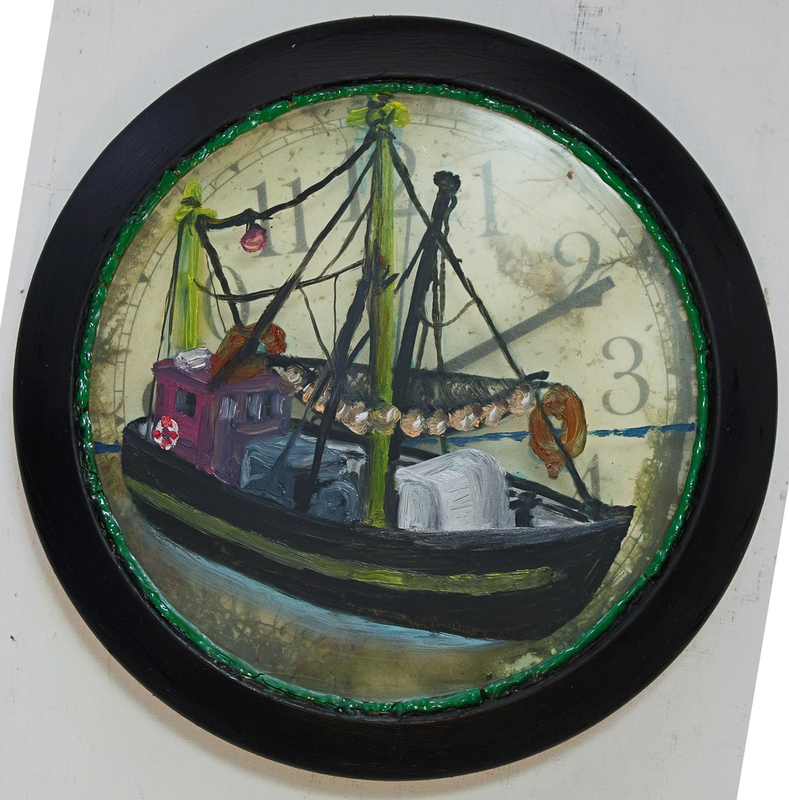 For the painted renditions, I chose a variety of surfaces – paper plates, cut off piece of old football, ceramic plate, old kitchen clock, vinyl LP record, and canvas board. and adding varnish on top of dried thinned oil paint. 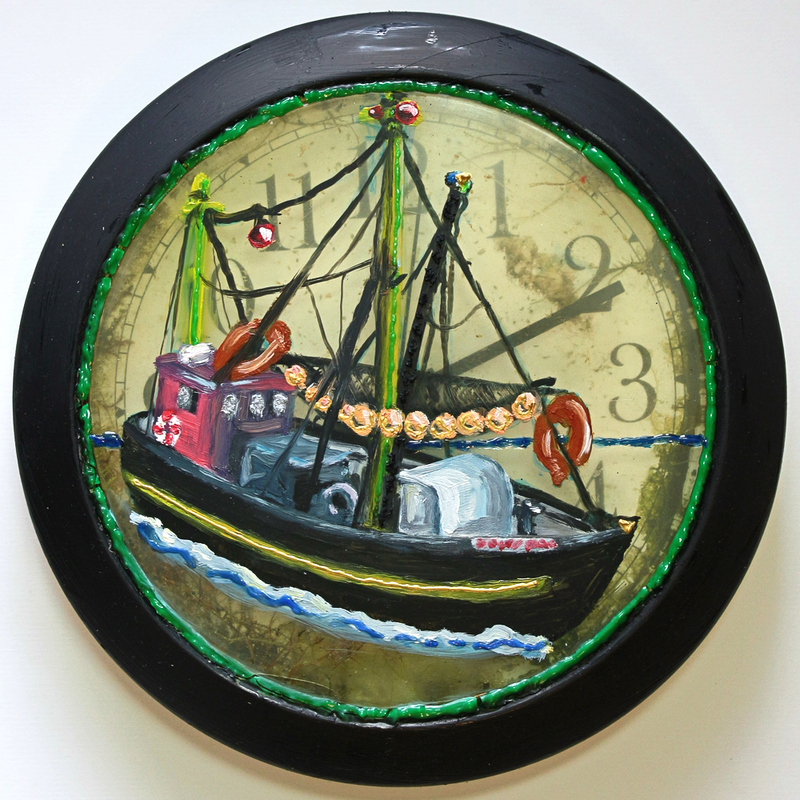 Part 4: Exercise 4.4 – ornamental boat on shelf painted on clock surface – thick and thin, a wee bit wonky! very flat and uninspiring result. sharper image but more difficult to apply. 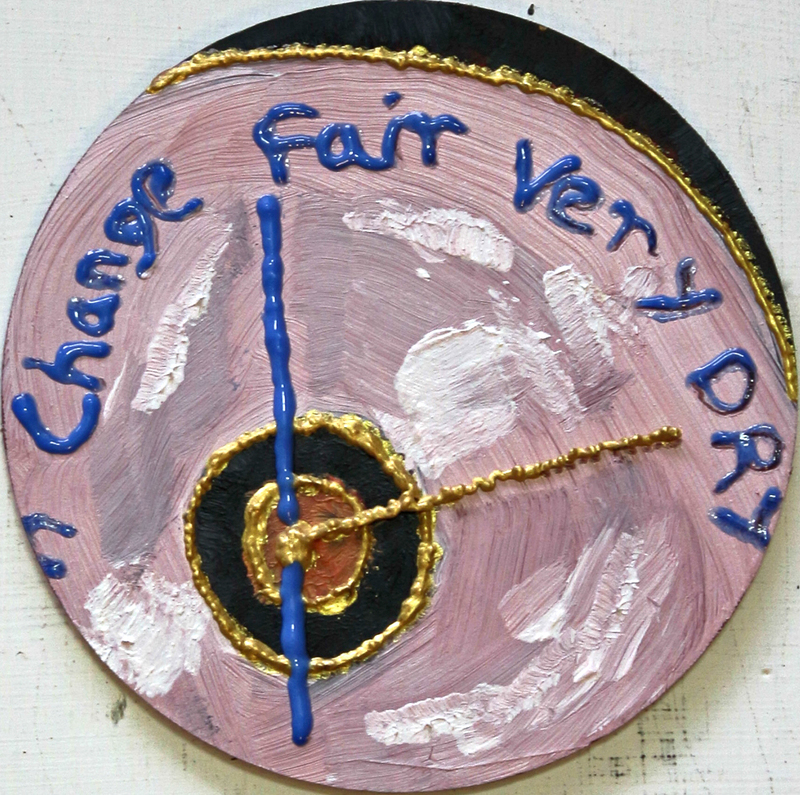 How do I think my work in Part 4 stands up to the course assessment criteria? I think that I managed to identify and capture interesting compositions of domestic interior scenes from around my house, utilising a range of perspectives and approaches. The thinning of the oil paint worked pretty well overall and it was fun to apply it to the various surfaces. However, some of the results of applied thinned paint turned out quite dull and flat depending on the surface used (cut off old ball, paper plates), and it was only with thicker applications of medium that the images sprung to life. 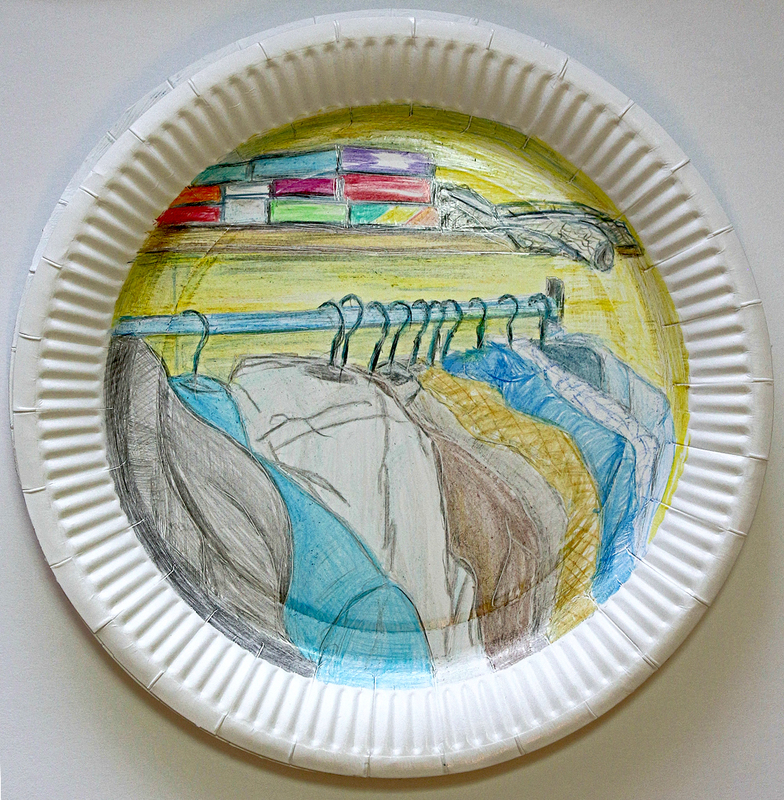 Coloured pencil is not something I use very much so it was interesting to test myself with the three circular drawings on paper plates and I am quite pleased with the results. It is interesting how everyday scenes and objects can become the subject of quirky, focused snapshots of domestic interiors that we take for granted. 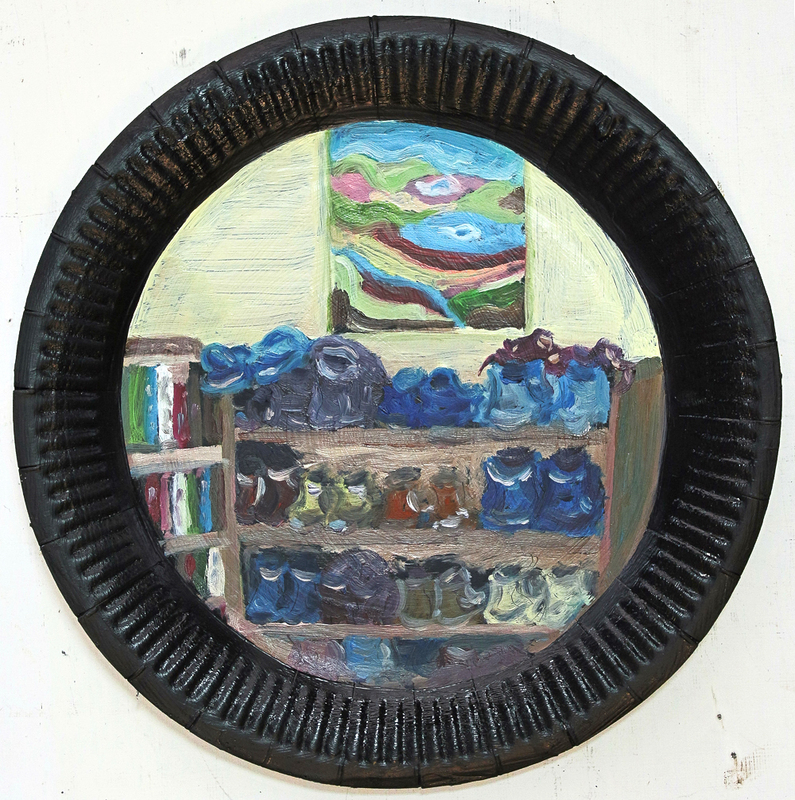 I enjoyed this aspect of the exercises and can see how the use of tondo (circles and ovals) can act as an intriguing window into specific scenes. 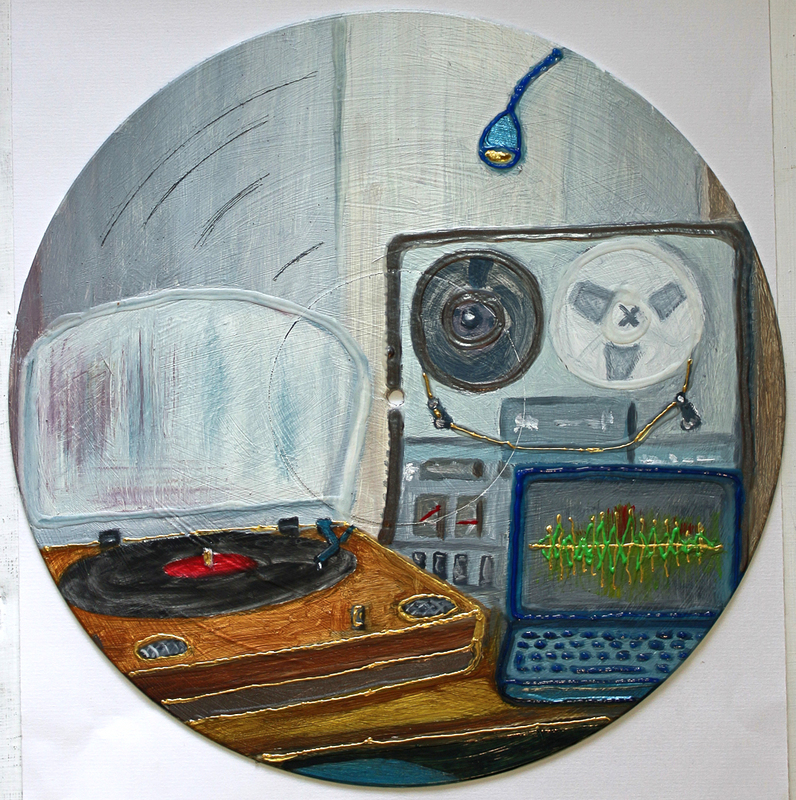 While more traditional surfaces such as canvas board and plates worked well, I found that experimenting with surfaces such as old vinyl LP record, old wall clock and cut off piece of an old football were more challenging and added an extra dimension to the resulting painted scene. 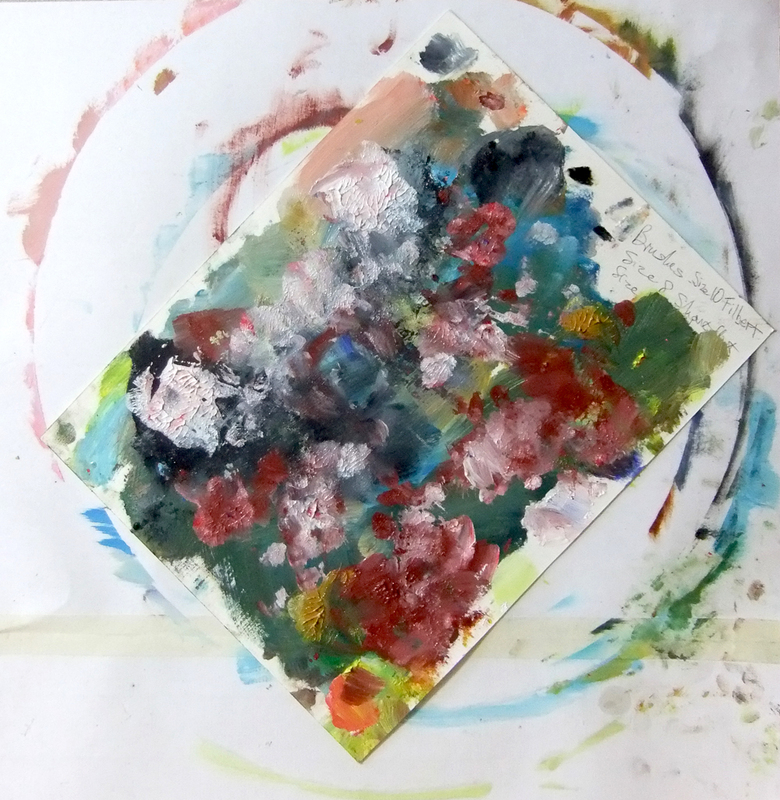 Experimentation is certainly one element that I can see emerging into my work as part of this course. 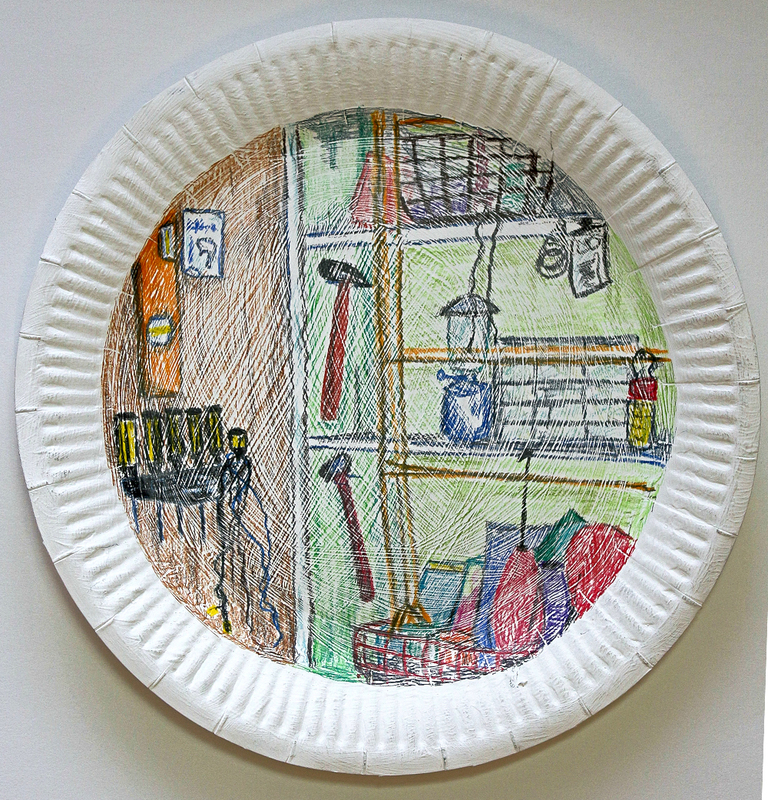 I also like to think that my work here has been imaginatively constructed and hangs together as a series of unusual domestic interiors. 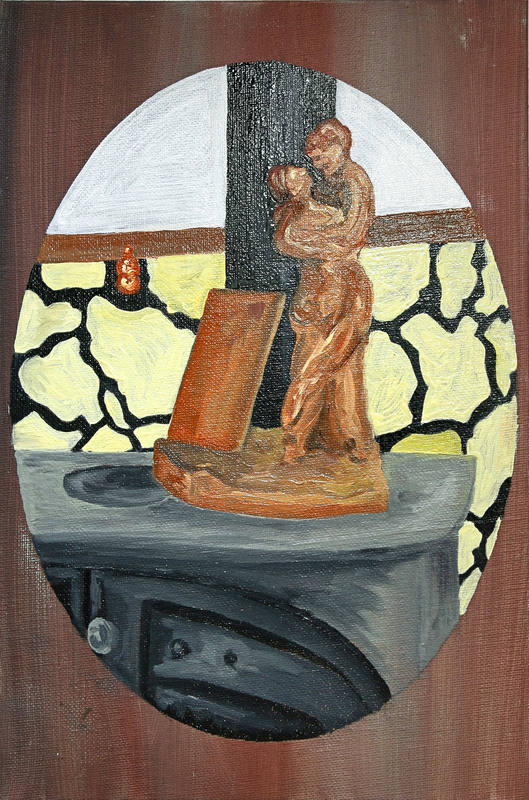 My online learning log https://stuartbrownleeocaupm.wordpress.com contains images and textual commentary of my Part 4 work [no password required]. 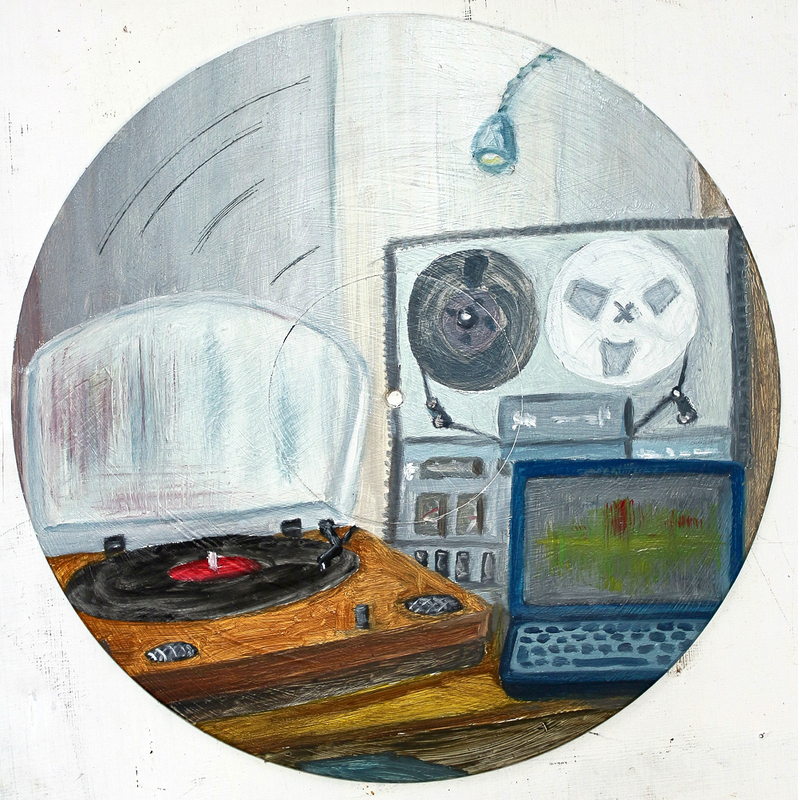 Also available on the learning log are images from my sketchbook as well as my research notes into artists known for their work in the Tondo format and depiction of Domestic Interiors. Artists that have influenced me in this part of the course are: Michelangelo, Parmigianino, Titian, Caravaggio, Mindy Lee, Frans Hals, Fragonard, Robert Delaunay, Escher, Dali, Edefalk, Rostovsky, Mark Fairnington, Iain Andrews, Henry Acloque, S.E. Hall, Virginia Verran, Harald Kroner, John Currin, Harold Gilman, Richard Diebenkorn, Philip Guston, Catherine Murphy, Wayne Thiebaud, William Kentridge, Albert Oehlen, Kate Gottgens. 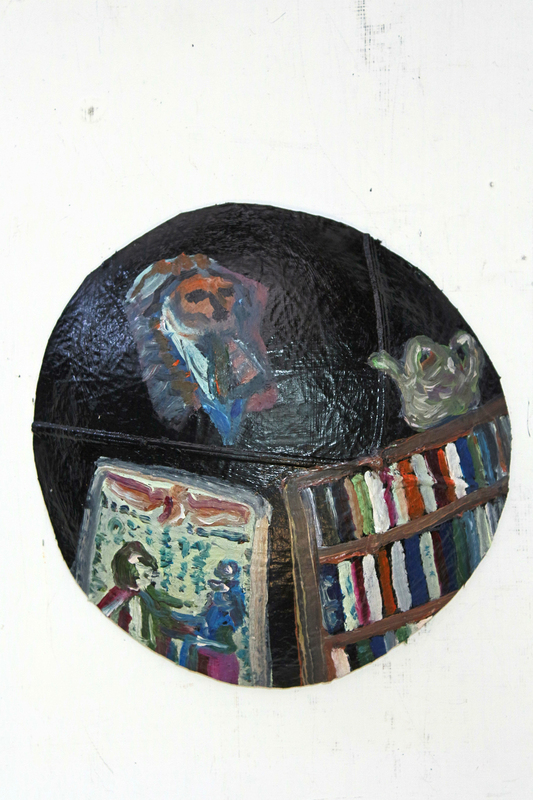 In my research ideas for tondo painting I mentioned trying to create a piece along the lines of Parmigianino’s ‘Self portrait in a convex mirror’. 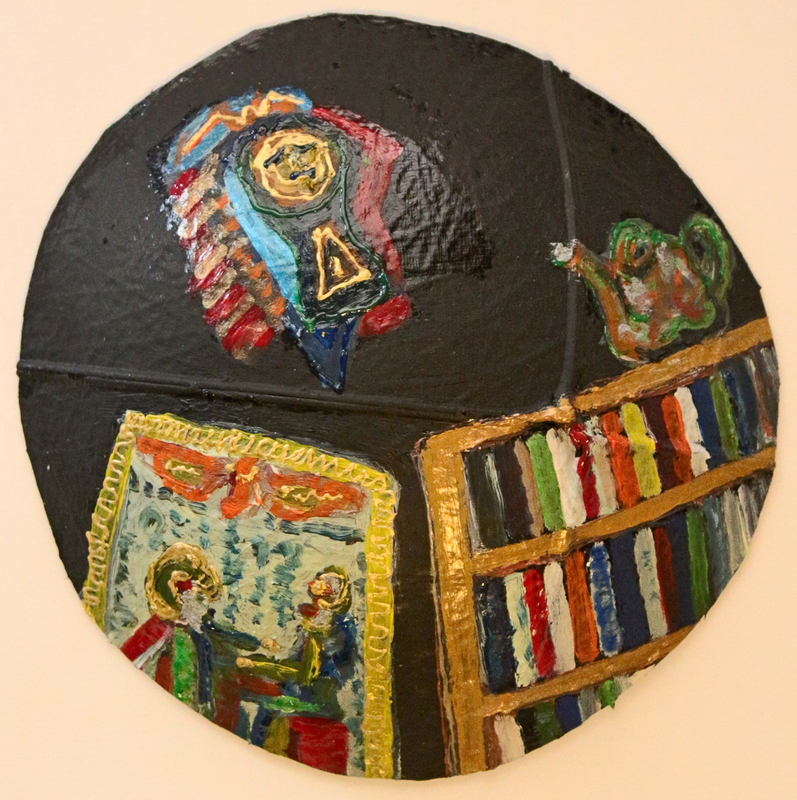 While not painting a self portrait, I did manage to capture some of the sense of the convex format in using the cut off piece of old football on which to depict a domestic interior scene. Of my other research ideas, I did manage to make use of a variety of surface grounds, layering of paint and some storytelling. 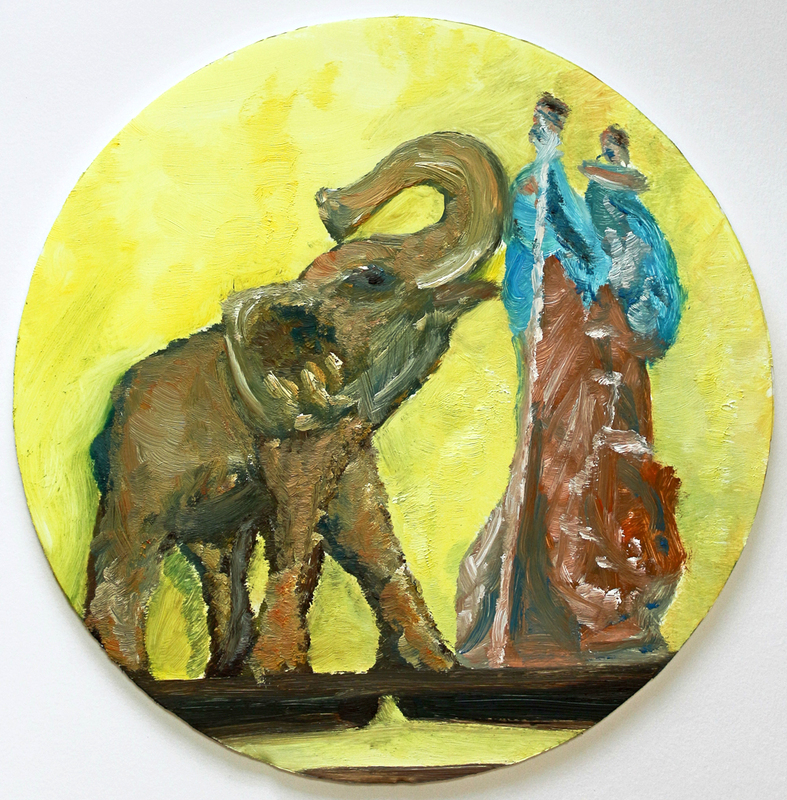 However, there is not much sign of abstraction or surrealism and certainly nothing I managed to produce came close to the “visceral, thickly-painted, edible-looking paintings’’ of Mindy Lee’s ‘John’s Overfaced (Bellini)’ – maybe another time? I plan to continue with oil paint in Part 5 of the course and I want to experiment more with mixing thinned and thicker applications of oil paint to achieve different textures, mark making and painterly effects. 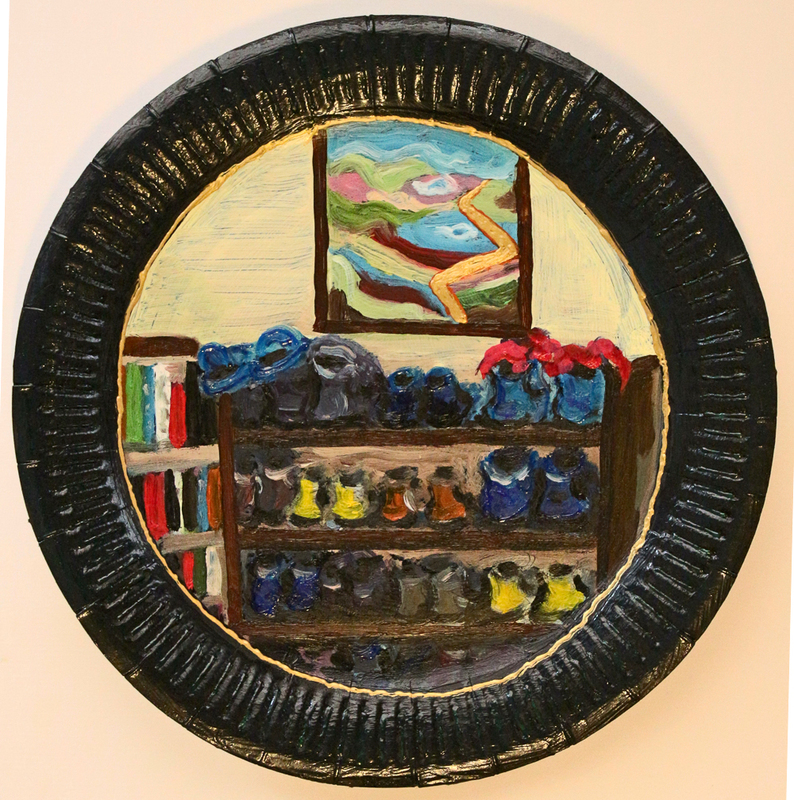 Using the paintings you made in Exercise 4.1, look at the scene you painted and add thicker paint to these thinly painted works. Leave areas of the thinly painted work visible. What effects have you created by applying areas of thicker paint? 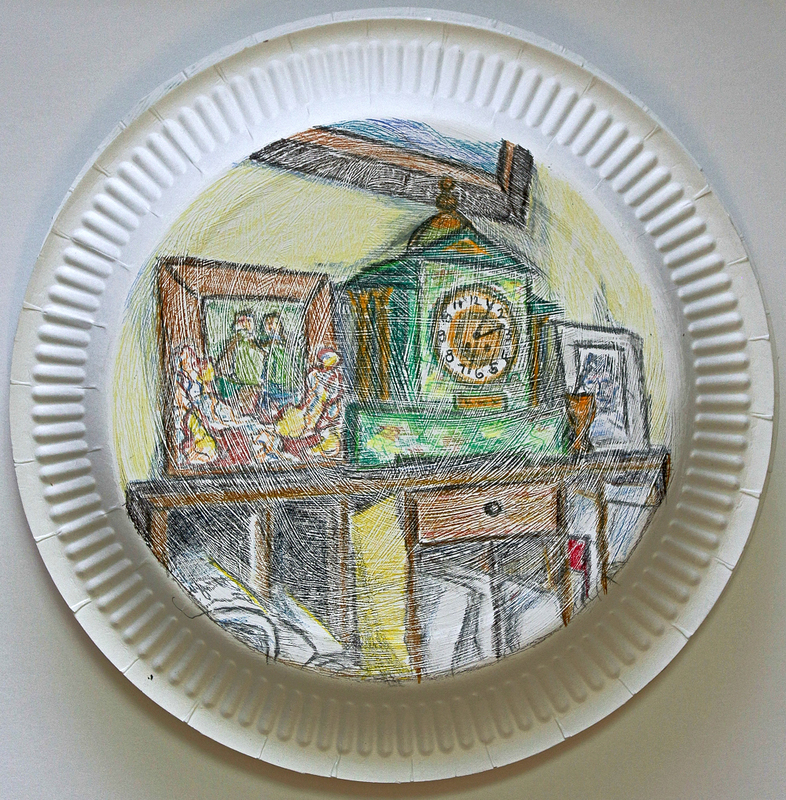 Adding gold, blue and green relief paste and brown, yellow and red nail varnish picked up the image on a plate to become a more sizzling version of one of my domestic interiors – particularly the ‘golden road’ in the picture on the wall. OK, photographed on a slightly different background, but nonetheless the addition of relief paste and nail varnish has definitely lifted the colours. Judicious use of relief paste and nail varnish has brought this image to life – the gold relief paste has a lot to do with this I think. Lift off! or rather ‘sail off’ with confidence – brighter, picked out colours again using oil paint, relief paste and coloured nail varnish. Feeling a wee bit queasy – well look at the horizon and not the clock! 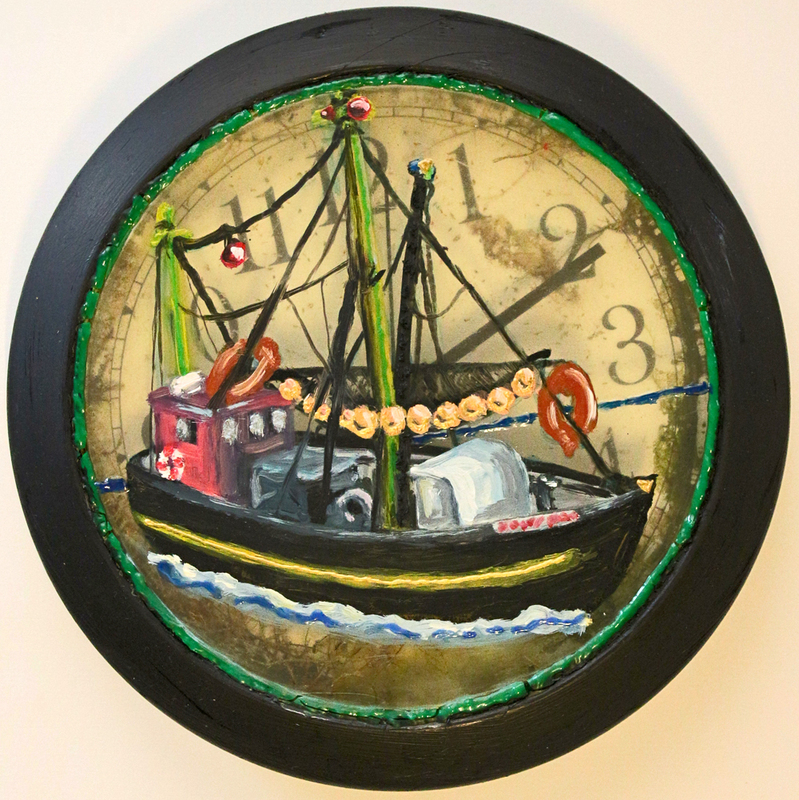 I rather like this angle and the beauty of painting on the clock is that the image can be viewed in a number of ways. Restrained addition of thicker media on top of thinly applied oil paint. Again telling a story, but now with some striking highlights. Make a very fluid painting of any subject on the list. Once this has dried, paint or spray with gloss varnish or nail varnish. Use any size, any surface, any media. What effects can you create by applying varnish? Make some notes in your learning log. I selected to make a painting of a corner of our living room at home. In this specific corner is the source of our main form of heating – a wood burning stove. 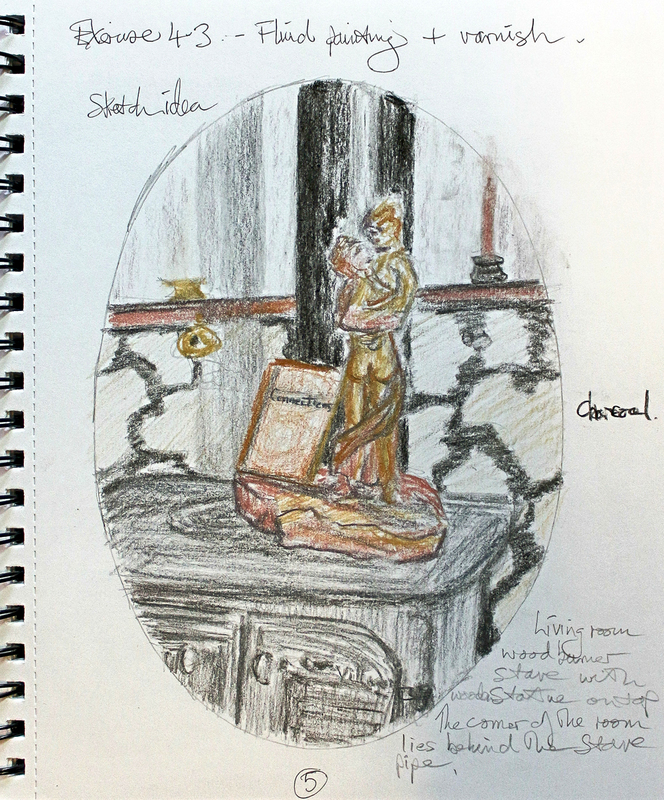 The charcoal sketch of my painting idea can be found here. For the painting itself I wanted to continue to experiment with thinned oil paint, although this time I used Reeves painting medium instead of Liquin to see what difference there might be. Using a 20x30cm canvas board I prepared a ground of warm brownish acrylic onto which I drew an appropriately sized oval. I contemplated using a grid system to transfer my sketch drawing to the canvas board within the oval format, but instead projected a photograph of the sketch onto the board, mostly to save time. 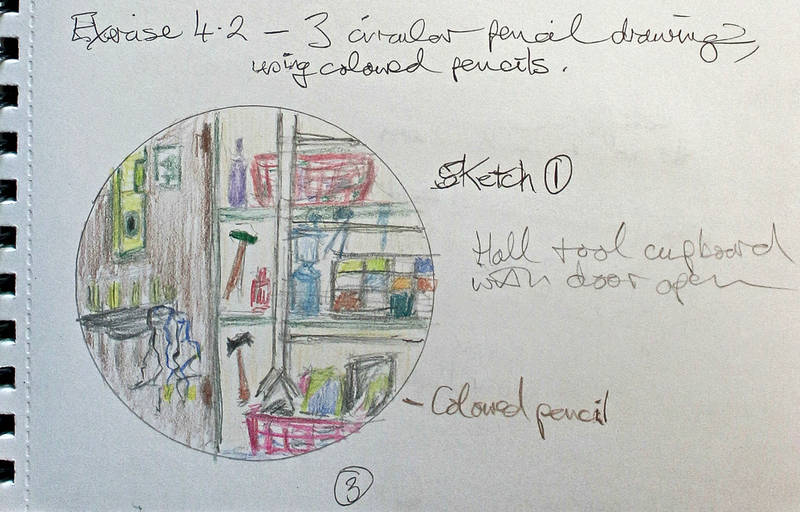 The image was sketched into the oval using an HB pencil prior to painting. The first thing I noticed was that the painting medium used with the oil paint took a fair bit longer to dry than the Liquin I had been using in the previous exercises. In this application of thinned paint I mainly picked out highlights and shadows and to provide additional small detail. 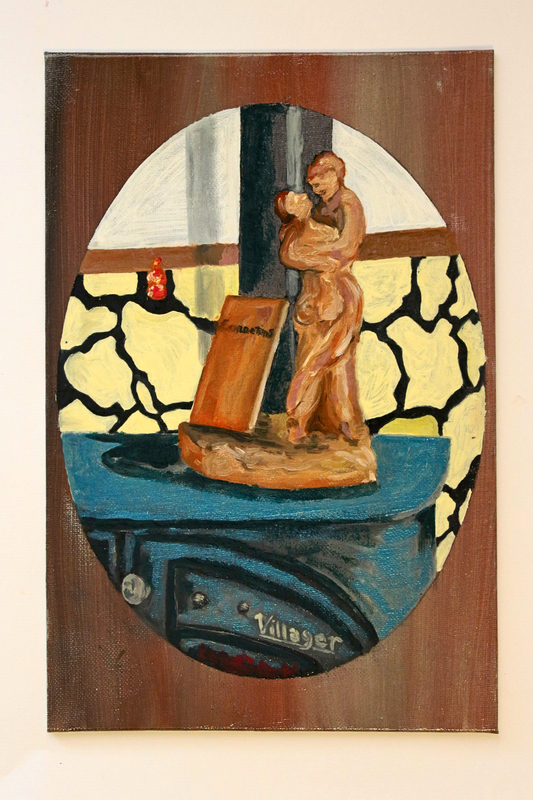 I think that the addition of the varnish, and in particular the coloured nail varnish brings the image to life a bit more – the blue nail varnish on the stove kind of ‘sings’, and I like it. It’s not what it looks like in reality, but it makes me smile! Finally, the door handle of the stove in the bottom left corner is maybe tempting you to open the door – do you want to let the fire out?